These Arts Should Be Approached With Patience And A Willingness To Learn From Mistakes! IN NO OTHER PHASE of gunsmithing does one have the opportunity to improve the appearance of a gun and express his artistic ability with a minimum tool requirement as in checkering. Every tool needed can be housed in a common cigar box except for the checkering cradle, which can be tucked away in a corner of a closet. Some stock scratchers manage to do beautiful checkering without a cradle, holding their work with one hand, pushing the tool with the other. But, if you are not an octopus or lack a grip like a vise, use a cradle. 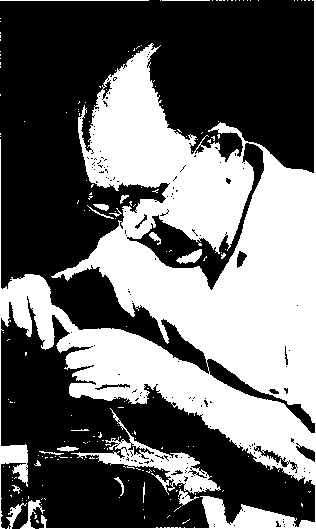 As for cost, a good set of checkering tools can be purchased for less than fifteen dollars. You can even make your own tools out of less than two dollar's worth of drill rod. The fundamentals of checkering are relatively simple. The tools are inexpensive and easily stored. Even poor eye sight is not too great a drawback with a magnifying glass and short work periods. But checkering is slow, painstaking work and one who is short on the patience probably will be" ahead to let someone else do his checkering. But if you take it easy and don't try to get the whole thing done between dinner and desert, you have the main problem licked. It is a matter of patience, criticizing your own work, practice, trying to do better on the next pattern - and more practice. Nils Hutgren, a key man in the development of the early Winslow rifles line, is a member of a passing breed; a master, his stock carving is considered outstanding. Stan de TreviHe No. 12 pattern is on Herter's cherry stock. Work takes time, but is classic to enthusiasts. the dished-out section up on the forearm. He can ignore it and put finish right over the top of it. The final and best choice is to recut or trace the pattern. This process goes under a half dozen or so aliases such as recutting, retracing, pointing up, but the most commonly used phrase is "tracing." 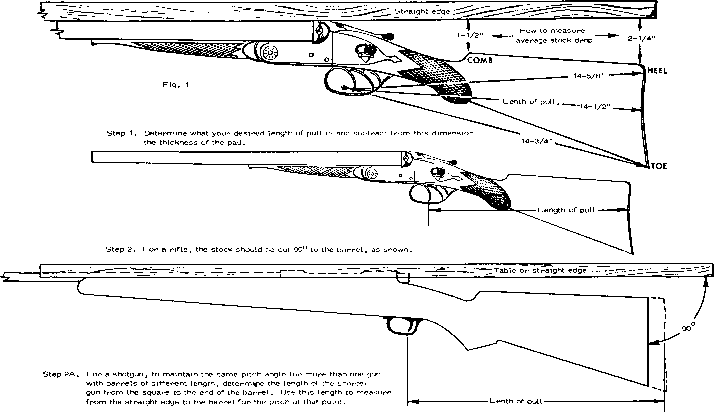 Not only will tracing the pattern improve and renew the general appearance of the stock, but will give the hobbyist an excellent opportunity to get the feel of checkering tools and learn the basic fundamentals. To get started in checkering, first recut a few patterns on old stocks. Checkering is no more than a series of parallel V grooves cut to a depth of about 1/16-inch into a stock and crossed at a sharp angle by another similar series of parallel grooves of the same depth. The space between these two series or grooves are formed into hundreds of tiny pointed diamonds. The tools used to cut the grooves are very tiny saws with their cutting edge shaped in the form of a "V". While its primary purpose is to provide a better grip on the stock, checkering can be done in a way that will compliment and accentuate the lines of the stock. A properly chosen and executed checkering pattern can turn a plain piece of wood into a thing of beauty. At the same time, an elaborate, wild and glaring pattern can ruin the appearance of a fine piece of figured wood. The basic tools used are the layout cutter (usually called the spacer) and the single cutter. 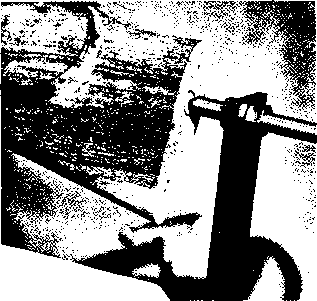 The single cutter is shaped in the form of a V with the cutting edge on the sides of the V. When pushed across a piece of wood, these teeth cut into the wood and leave behind a groove, also in the shape of a V. The spacer cutter has two rows of teeth or two V's and, when viewed from the front, appear similar to the capital letter W.
The longest journey starts with the first step and that first step is to cut one straight V groove with the single cutter to full depth. To form the series of parallel grooves, you lay aside the single cutter and switch to the spacer cutter. Place one leg of the W cutter into the groove you have just cut and push the spacer cutter forward and away from you. The leg that is riding in the first groove will guide the tool while the other leg is cutting the second groove parallel to the first groove. When this new groove is cut to full length, the tool is lifted and the guide leg is placed into the second groove and the process repeated the same as before, to cut the third parallel groove and so on, until the whole series is completed. The first groove that is cut is called either the guide line or base line and is cut to full depth. The other base line that will cross this line at an angle is also cut to full depth at the same time. These two lines are cut first before any others for all the additional lines will be based on these two. The angle at which they cross each other will determine the shape of the diamonds. This angle varies with the personal taste of the person doing the checkering, but a diamond that is 3V2 times as long as it is wide is the accepted standard. If the diamond angle is much sharper, they have a tendency to break off, as their base will be too narrow to support them. At the same time, diamonds thicker than this will have a square, box-like appearance. A somewhat square form of checkering known as English flat checkering, is used seldom. After the lines have been laid out straight and true, the diamonds in good proportions, the grooves must be cut to a depth that will bring the diamond to a point. The average beginner saws back and forth with the spacer tool in an attempt to cut the lines to this depth. The tooris a spacer and, as this name implies, it is used to lay out and space the lines only. When its work is finished it is put aside and the single cutter is used to bring each line to full depth. But even this must be done in at least two passes over the lines; sometimes three or more passes will be needed. If the beginner thinks he can take a short cut and make one pass do it all, he will sail along fine in the first series of parallel grooves and probably compliment himself mentally upon how smart he is. But when he starts to cut the second series, the truth will hit him. The tool jams and digs in when it tries to cut across the full depth of the grooves in the first series. It is like trying to drive a car across a plowed field at a fifteen-degree angle to the furrows. The rows keep trying to turn your front wheels and make you follow their path. If one makes his first deepening pass to half depth or less, the second series will present little problem. As the next passes are made, the grooves will be deeper and provide a better guide, yet the lines they are crossing will be at equal depth. When all lines have been brought to full depth, the diamonds should be pointed. A few usually are not, and the checkerer must make a pass or two with the single cutter to bring them to a point. All grooves and diamonds are combined into a group and called a pattern. This is all of the metal necessary to build checkering cradle. In background is the unit after it is assembled. done and what is required in the way of patience. Before you start refinishing your stock, take a close look at the checkering. If the lines are sharp, go ahead with the refinishing and forget about the pattern until the stock is finished. That of course, is assuming that you keep the sandpaper off the pattern. If the lines are shallow or parts of the pattern worn, you will have to deepen the lines before you start the refinishing. If you fail to do this at this time, the sanding process may remove what is left of the lines and retracing will be difficult, if not impossible. Tracing before refinishing does not have to be to full depth. In fact, it would be a waste of time as the pattern will have to be gone over after the refinishing to remove any finish that has gotten into the grooves. Trying to mask the checkering with tape never seems to work to one hundered percent satisfaction and should be done only when the original checkering is of a quality that should not be traced. Masking must be done carefully with the tape right on the outside groove or border line and this takes time. It is a lot simpler to finish the stock as though the checkering were not there and clean the grooves out after the last coat has dried. The best tool to trace the lines in the pattern is the regular checkering single cutter with the finishing touches being done with the commercial checkering file. If you have only one stock to do or would rather give checkering a whirl at the lowest possible cost then you can make a simple tool to do the job. I used one of these tools for quite a while, back in my early kitchen table gunsmithing days. It's simple, but I know one professional who still uses one for retracing, rather than a single cutter and he has a boxful of those. To make the tool, you need a small triangular metal file, the smaller the better. A four-inch size with as little taper as possible is ideal. Hold the tang with a pair of pliers and heat the forward two inches of the file to a dull red. This can be done over the kitchen gas stove. New forearm is in checkering cradle, ready to receive the pattern. Holder is two-diameter wood dowel through the forearm, supported at each end by the cradle's uprights. This simple checkering cradle, mounted on a 2X2 and held in a vise, has a stock in place, ready for work to begin. will hold the tip, while you bend it. When you have finished bending the curve, the file will have cooled and be somewhat softer than originally but still hard enough to do the job in wood. If you want it hard, all you have to do is heat it back to a dull red and quickly plunge it into a container of water. The colder the water, the harder the file will be. With the curve permanent, the next step is to break off the smooth tip that does not have any teeth on it. This can be done with the pliers or by catching the tip in a crack or laying it across a board and tapping it with a hammer. If you have a grinder handy, square up the break. You can remove the file teeth back of the bend if you wish, but this is not necessary. In the checkering cradle described, the rear of the stock is supported by nothing more than point of threaded rod. Finally, put some kind of handle on the file. Using a file without a handle, one slip and the tang can drive itself through your hand like an ice pick. Not only will this be painful but permanent damage can be done to the muscles and nerves of the hand. File handles are inexpensive and available at just about any hardware store or you can make one out of a piece of old broom handle. Drill a small hole in one end to accept the tang or the hole can be burned into the handle with a nail heated red hot. All else failing, you can fall back on the farmer's file handle - the corn cob. The old red corn cob finds itself being used for a lot of varied purposes around a farm. The stock should be carried through the stripping stage before any checkering or tracing. This is to remove the dirt and grime that has worked its way down into the grooves along with the old finish. This dirt and grime will make short work of the file's sharpness and dull a checkering cutter. Allow the stock to dry fully and double check by holding it near a heat source. Trying to cut the grooves in a damp stock usually results in some of the diamonds being torn off. In use, the homemade bent file is placed in one of the grooves of the checkering pattern with the tip slightly up and the bottom of the bend resting in the groove. The forefinger is rested on top of the file, pointing toward its tip. Most men find this the best way to hold any checkering tool, since it places the hand in a comfortable position with the forefinger acting as a pointer along the line. With a smooth, steady stroke, push the file forward along the groove. Don't try to guide or aim the file, for to do so will cause the file to ride out of the groove. No one can guide a cutter and make a long cut without zigzagging or washing out the line. Instead, let the length of the file that is riding in the groove do the guiding. Remember, the file does the guiding, not you. How to make checkering cradle?